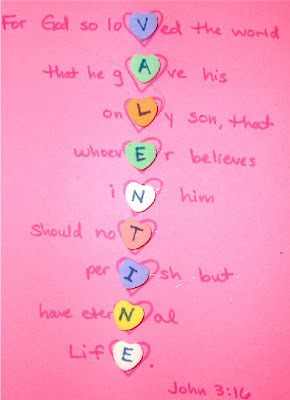 I had seen this cute idea online in multiple places to spell out the word “Valentine” using the bible verse John 3:16. So I thought, “Why not make that into a kid’s craft?” 😉 Took a little tweaking to convert it from the KJV to the RSV, but I figured it out. 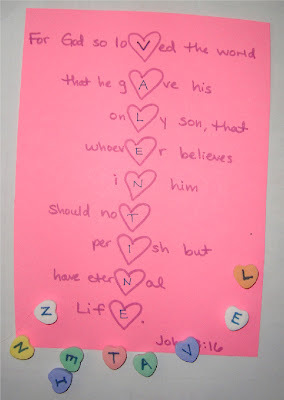 For older kids, they can start by writing “Valentine” down their paper any way you choose (in this example, I spelled it out written on heart shaped stickers). I also thought it would be fun to do one with conversation hearts! (Please don’t eat conversation hearts after you’ve written on them with a marker and glued them to paper, ok?) lol! My daughter is only 3, so I wrote it all out for her and just let her match the letters up and glue them on herself. Love it! Thanks!! I pinned it. God Bless! Two thumbs up what an awesome project. I did this project with my 7th & 8th graders tonight in our Formation class at St. John Newman in Houston, TX. Thank you for sharing this activity for children to learn about our Lord and Savior just another way to get kid all fired up about learning. Next week we are doing your Rosary project. I am so blessed to have found this wonderful place! You are amazing and I promise to share with all I can. Thank you for this gift!! I loved this! I’m using it at church in the morning. I teach Junior girls. Thanks! God Bless you with a Happy Valentines! 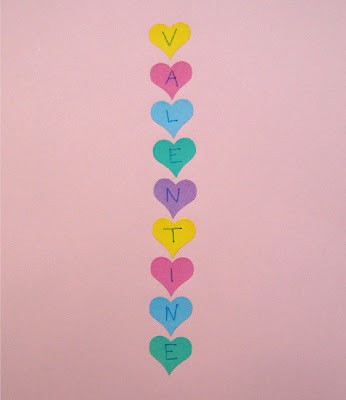 I will be using this with my 3rd graders next week (16th Feb, 2014) as a fun craft to celebrate Valentine’s Day!